In this lesson, students consider the human tendency to collect objects that have meaning to us. They meet Forrest L. Merrill, a long-time collector of vessels made of wood, metal, glass, fiber, and clay. They learn how Mr. Merrill has spent his life collecting these hand-crafted objects and developing friendships with the artists who make them. In a segment of the Craft in America episode VISIONARIES, students hear the collector talk about what is important to him in the objects he collects—what he looks for when he considers adding a new object to his collection. Students are asked to think about their own collections and collections that their friends or family members have. As they consider the idea of collecting, they learn how collectors tend to organize and display their collections. While viewing VISIONARIES, students briefly meet Michele Ellis Pracy, Fresno Art Museum curator, who is curating an exhibition of work by fiber artist, Kay Sekimachi. Students spend time considering Ms. Sekimachi’s Leaf Bowls—how they are made and the message or story they convey—and they also learn about the role of a curator. Students work individually or in small groups to curate an exhibition of a collection of their choosing. They must provide a rationale for the inclusion of each of the artworks or objects. They must also create an exhibition plan—a diagram or drawing of the exhibition space and the pathway to be followed by visitors to the exhibition—accompanied by a “vision statement,” in which they outline the message or story that the exhibition conveys. I’m not particularly interested in just showing pretty things. I want the work to have a story. I want the artist, through the work, to tell a story. I would like there to be some message or some goal to share with people this totally different way of life, of living with art. Collector Forrest L. Merrill has a deep appreciation for all manner of hand-wrought vessels of wood, metal, glass, fiber, and clay, as well as for the exceptional artists who create them. But even more important are the personal relationships he forges with these artists and his desire to share his unique collection with a public for whom art education and exposure to art is disappearing. Inspired in 1950 by a high school art teacher, his first purchase was a glass bowl by Glen Lukens, a pioneer in studio crafts. Right then, a collector was born. Merrill’s collection, based in Berkeley, CA, is one of the largest and most important of its kind in the world, containing pieces that span the arcs of entire careers of major artists of the 20th and 21st centuries. 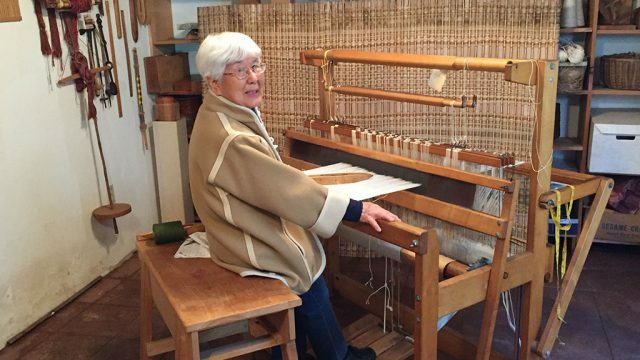 Kay Sekimachi is a fiber artist and weaver, known as a “weaver’s weaver” for her unusual use of the loom in constructing three-dimensional sculptural pieces. She is recognized as a pioneer in the resurrection of fiber and weaving as a legitimate means of artistic expression. In the early 1970s, she used nylon monofilament to create hanging quadruple tubular woven forms in an exploration of space, transparency, and movement. Sekimachi’s primary sources of inspiration are the shapes, forms and natural colors gleaned from her Japanese heritage. She attended the California College of Arts and Crafts, where she studied with Trude Guermonprez, and at Haystack Mountain School of Crafts, where she studied with Jack Lenor Larsen. Human beings often collect things, and when we do, we tend to store, care for, produce an inventory, and display the collection for others to see and appreciate. Collectors and curators consider various techniques, methods, venues, and criteria when interpreting, selecting, and curating artworks and objects for a viewing audience. Artworks and objects collected, preserved, or presented by collectors and curators communicate meaning and often tell a story of personal, social, or cultural significance. People gain insights into meanings of artworks and objects by engaging in careful description and interpretation. How do collectors organize and display their collections? What is involved in curating an exhibition? Understand that people often collect artworks and objects that alone and collectively have meaning and tell a story. Speculate about why people collect artworks and other objects. Curate an exhibition of artworks or other objects by choosing artworks/objects that are to be displayed, deciding where and how they will be displayed, and providing a vision statement to explain the curatorial choices made. Create a two-dimensional exhibition plan indicating the placement of objects and viewers’ pathway through the exhibition. While the work in this lesson begins with collecting and curating artworks, the concepts having to do with how humans collect objects that have meaning to them or to their community extend beyond visual art to other subject areas. Curatorial practice is basically the same, even when the objects collected and the ideas conveyed through the display of the objects are different. Students easily might collect and curate objects having to do with history, science, mathematics, and foreign languages, for example. There are several opportunities in this lesson to practice and refine writing, in the creation of a vision statement, certainly, but also in the rationales provided for objects in the collection and the interpretive labels that will accompany the objects in the exhibition. This lesson addresses the following standards. The performance standards listed here are directly related to the lesson’s goals. Students will be asked to visit exhibitions on Craft in America’s website to analyze how artworks are displayed. A Google image search for “exhibition design plans” or “exhibition design models” will result in an array of examples of plans and models for exhibitions for students to examine. Ask students if they now have or if they have ever had a collection of any sort. Perhaps they know someone—a family member or a friend—who collects something. Remind them that people collect all kinds of things, everything from rubber ducks to comic books, bottle caps to Pokemon cards, baseball cards to teddy bears, Barbie dolls to transformers. Some people collect rocks, shells or sea glass. Invite students to share what they or someone they know collects. As you discuss collections, ask students to think about why it is that people collect things. Have them consider further how people choose something to collect. Elicit from students that people tend to like whatever it is they collect. They tend to be drawn to the objects they collect, perhaps because of the way they look, perhaps because they have special meaning in their lives, or perhaps because they have access to these particular objects. Explore a range of reasons why people have collections. Suggest that people organize, care for, and display their collections in different ways. Here again ask student to recall collectors they know and their respective collections. Where are these collections kept? Some people store collections in shoeboxes or other containers. Some people store the collection as a display on shelves or tabletops. Occasionally an entire room or building is devoted to a collection. Much depends on the collection—what is collected, the size of the objects collected, the number of objects within the collection, and so on. Collectors also tend to organize their collections. Have students share how collections they know about are organized. Are there categories and subcategories within the collection? Again, depending on the collection, objects might be grouped together according to their history, function, or appearance, for example. This should be a lively discussion in which students are invited to recall collections they have had or have seen and to think about them in new ways. Students should recognize that many of us collect something, and when we do, we tend to store, care for, produce an inventory, and display the collection for others to see and appreciate. Tell students that in the video segment they are about to see, they will meet Forrest L. Merrill, a man who began collecting artworks when he was in high school. His collection has grown over the years and includes artworks created by many different artists, but in this video they mostly will learn about his collection of artworks by the artist, Kay Sekimachi. The segment opens with Michele Ellis Pracy, a curator with the Fresno Art Museum, claiming, “Kay Sekimachi is a visionary.” As a curator, Ms. Pracy selects, interprets and presents objects in an exhibition. In this case, she is responsible for selecting and exhibiting artworks created by the artist Kay Sekimachi for an upcoming exhibition of her work. We will see her talking with Forrest L. Merrill because the exhibition will include many of Sekimachi’s artworks borrowed from his collection. What kinds of artworks does Forrest L. Merrill collect? What does Forrest L. Merrill value or look for in the artworks he collects? Watch Forrest’s segment beginning at 31:03 to 38:00 at www.craftinamerica.org/episodes/visionaries. Discuss the video. Ask students to share their immediate response; what resonated with them. Refer to the questions that students were asked to consider along with others listed here. What do students think a curator would need to know in order to do the job? What questions does she or he need to ask? Explain that curators care for and maintain collections; they also select, interpret and present objects from the collection for others to see and appreciate. Curators need to know a lot about the objects in the collection, including their origins, significance and meaning. In creating an exhibition, curators need to consider the audience who will see the exhibition, which objects to exhibit, how the objects should be arranged in the exhibition, what they would like the audience to do and think about as they view the exhibition—the story or message they wish to provide for the audience, and how they will convey the story or message by the way they arrange the objects. See Resources for links to more about curators and their work. In order for students to appreciate how objects in a collection have meaning, provide them an opportunity to carefully view and interpret Kay Sekimachi’s Leaf Bowls. View the segment on Kay Sekimachi in which she demonstrates making her Leaf Bowls. Watch Kay Sekimachi’s segment on Leaf Bowls beginning at 25:10 to 26:39 at www.craftinamerica.org/episodes/visionaries. Review the process the artist uses to create the Leaf Bowls. Make sure that students realize that these are real leaves that have been soaked overnight and then are dried around a mold. So that students might look more carefully, project an image (or provide students with photocopies) of one or more of these bowls. Remind students that Forrest L. Merrill collects this artist’s work and that he has several of her Leaf Bowls in his collection. Remind them also that he says he is not simply interested in beautiful objects; he is interested in objects that tell a story or convey a message. 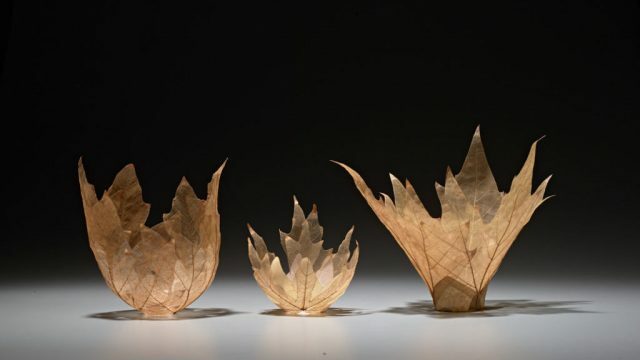 Have students describe and discuss the story or message conveyed by Sekimachi’s Leaf Bowls. Introduce metaphor—a figure of speech in which one thing is seen as or presented as something else. Remind students that it is sometimes useful to use metaphor when thinking about artworks. In this case we would be thinking of Kay Sekimachi’s Leaf Bowls as something else. A skeleton, memory, lace, or a vessel, for example. Exploring exhibitions: How are artworks/objects displayed? Have students work alone or in small groups on this project. They first will need to decide upon which of the following collection options they will choose as their focus. Option 1: Building on the Leaf Bowl. Option 2: Showcasing an existing collection. Create an exhibition of your own personal collection of five to ten objects. These may be shells, buttons, pottery pieces, or other objects that you have joined together as a collection. Option 3: Creating an exhibit as a self (or group) portrait. Create an exhibition of five to ten objects that represent who you are and what you care about. For each option, students should complete the worksheet, Collection Inventory, to complete a record of their collection and state why they have selected each object for the collection. Explain that before they create their plan for working alone or in small groups, students need to complete the worksheet, Exploring Exhibitions: How are Artworks Displayed?, to find out how a gallery space can be used to display artworks/objects in an exhibition. The worksheet is designed as a “scavenger hunt” in which the students explore three different Craft In America traveling exhibitions to find examples that match the description in the list found on the worksheet. Explain that the students will plan an exhibition of a specific collection for this project (see options 1–3). Have students first examine examples of such plans through an image search for “exhibition plans.” The results of the search will show plans that in many cases are far more detailed than what the students will eventually create, but these examples do show different ways to indicate the overall shape of the space, how the space can be divided by portable walls, and how shelving and pedestals might be indicated in such a plan. The placement of portable/temporary walls, if they choose to use them to divide the large gallery space into smaller spaces. The entrance and exit of the space, including the intended “pathway” for visitors. Where specific artworks/objects will be displayed, including shelves of various sizes or shapes, pedestals (tall or floor level), ceiling treatments, and walls. How and where various kinds of information will be presented; for example, as wall text and/or interpretive labels. The worksheet also prompts students to compose a “vision statement” including what they wish the audience to experience and learn from the exhibition, and a label for each object. Note that some students may wish to create a three-dimensional model of their exhibition that follows the specifications of their two-dimensional plan. A Google image search for “exhibition design models” will result in an array of examples of three-dimensional models for exhibitions for students to examine. Many of these models are made with foam board, which would be an appropriate material for students to use. They also might use cardboard or wood scraps or a combination of various materials to create a model exhibition space for showcasing their collection. Have students present their completed exhibition plans to the large class or in smaller groups. First, students should share their vision for the exhibition, stating the theme or ideas that the exhibition addresses—the message or story that the exhibition conveys. Second, students should point to and explain the flow of visitor traffic, noting what objects the visitor would encounter and how each object is displayed. Suggest that those who are the audience for such presentations ask clarifying questions and make a point to commend the student curators for aspects of the plan that they believe are especially well done. Optional: Teachers might opt to provide the above questions for students to address in their sketchbooks as an overnight assignment. This works well with high school. After students answer the questions on their own and bring them to class, have them open their sketchbooks for their classmates to read. A shared electronic document also can be posted by teacher and students can contribute their answers. Have ideas and are willing to speculate about why people collect artworks and other objects. Have curated an exhibition of artworks or other objects by choosing artworks/objects that are to be displayed, deciding where and how they will be displayed, and providing a vision statement to explain the curatorial choices made. Have created a two-dimensional exhibition plan indicating the placement of objects and viewers’ pathway through the exhibition. The Educators Guide are developed under the direction of Dr. Marilyn Stewart, Professor Emerita of Art Education, Kutztown University of Pennsylvania, Kutztown, PA. Visionaries: Collecting and Curating Meaning-filled Objects is authored by Marilyn Stewart with contributions by Dolores E. Eaton. Dec 2018. The CALIFORNIA episode is supported in part by STOLAROFF FOUNDATION, the National Endowment for the Arts, and the California Arts Council, a state agency. Learn more at www.arts.ca.gov.